Yusuf Abramjee | A MONUMENTAL DAY AS 250,000 SOUTH AFRICANS SIGN UP WITH THE DIALDIRECT NAMOLA EMERGENCY APP TO GET HELP FAST. South Africa- 250,000 South Africans have signed up to use the Dialdirect Namola emergency app. The app, which went national in September 2017, has assisted just over 20,000 South Africans in real incidents and recently released a brand new feature called Family Safety, which is aimed at providing additional peace of mind when it comes to keeping South Africans safe. The success of the Dialdirect Namola app can not only be seen in the number of South Africans that have signed up to use it, but also in the types of South Africans that are using it to get assistance in an emergency. Through the Namola Watch network, which allows neighbourhood watch groups and other community response organisations to respond to Dialdirect Namola user emergencies, we have seen hundreds of emergency personnel using the Dialdirect Namola emergency app to get assistance when they have an emergency. Thobile, a police officer with the South African Police Service in Gauteng has used the Dialdirect Namola app on six different occasions to get assistance. These have included calling an ambulance when he found himself in a shooting and a fire engine when coming across a fire in an informal settlement. Download the Dialdirect Namola app and Namola Watch FREE, either from the Apple App Store or Google Play, or visit www.namola.com. On the 27th of January, 67 Blankets for Nelson Mandela Day celebrated their fifth anniversary at The Linder Auditorium, at the University of the Witwatersrand in Johannesburg. The organisation was established in 2014, to help provide homemade blankets and scarves, to communities in need. 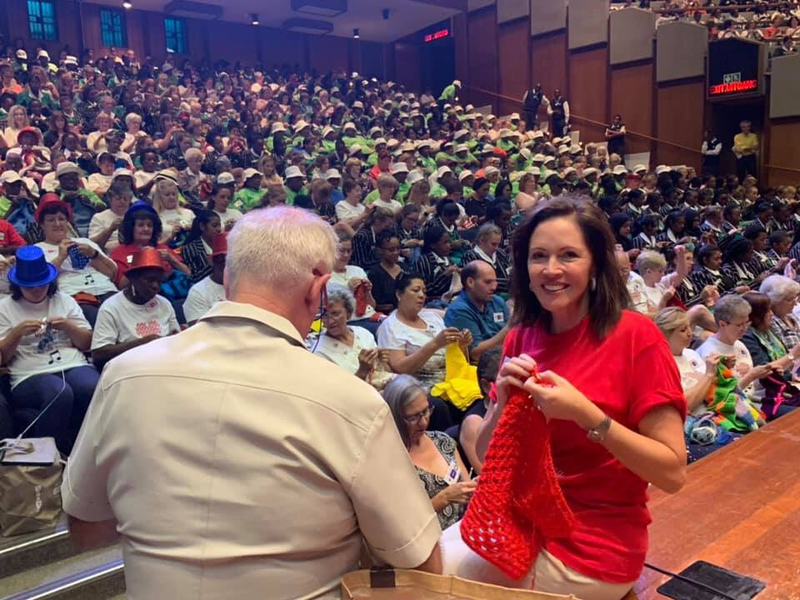 To celebrate the occasion, and pay tribute to the late, former South African President Nelson Mandela, a new World Record was set for the Most People Crocheting Simultaneously. The existing Guinness World Record of 604 people, had been achieved by The Singleton Crafters from Australia in 2017. 67 Blankets for Nelson Mandela Day surpassed this record, with a total of 737 people crocheting together on the day. They crocheted for a total of 27 minutes, each minute representing a year that Mandela had spent in prison. As the celebrations coincided with the anniversary of the birth of Wolfgang Amadeus Mozart, the event was called “Mozart for Mandela”, and participants were entertained with music by the composer, with performances by a string quartet and pianist Eliza Kruger, as part of the Johannesburg International Mozart Festival. There were also performances by the Jeppe Girls Marimba Band, as well as the Jeppe Pipe Band. The necessary documentation will now be sent through to the Guinness World Records Head Office in London, for the new record will be ratified within the next few weeks.